Starting a new language is fun and easy. Early on, you feel like you’re making so much progress, because from nothing, everything is 100% improvement. You’re still awkward and trembling, like a kitten stumbling around, trying to keep its balance. But it’s fun. Here you are, communicating with what to you are still essentially meaningless combinations of sounds. It’s thrilling. Then you get out of the classroom and go on a trip to that country, and you try it out for the first time. You can say “where are the toilets?” and “two beers, please” and “my name is, I come from…” The locals get excited, even tickled, because you can say a few things (unless you’re in France), and you feel good. You’re encouraged to keep going. You think, this is easy! You just need to learn a bunch more words and phrases, and you’re good to go. Sure, you can’t understand what’s being said most of the time, and you can’t converse outside what you’ve learned, but that’ll come with time, right? Surely you just need to learn a little tiny bit more. So you learn a little bit more. Suddenly, there’s the past tense, and the future tense. There are adjective endings and exceptions to rules and prepositions that don’t translate directly to your native language. There’s proper pronunciation, various formalities, maybe even a completely new alphabet that’s more complex than you thought at first glance. Things are getting tough! You realize you aren’t as good as you thought you were. Why, you’re still a complete beginner! You can’t even talk about your day without stuttering and stopping and starting over fifty times. How embarrassing! But fine, there can’t be much left to go. You press forward, through the thickets of vocabulary and conjugation, determined to at least be conversational. That’s when you’ll be satisfied—when you can talk about general topics and tell stories and so on, when you can read the newspaper and watch TV. Then you’ll be pretty much fluent, right? Right? So you did it! You’re conversational. You can talk on the phone as long as they don’t speak too fast or about something weird. You can understand radio interviews and some song lyrics. You can read kid’s books without a problem. It took you much longer than you’d originally thought, but you’re more or less there. So why are you still not satisfied? Because just look at that mountain. Just look at Mt. Fluency, its peak glimmering in the distance. It’s massive, and beautiful. You had no idea it was this big until you climbed up this far. And now that you have, you still feel like you’re at the bottom! You still can’t express yourself as easily as you’d like. You still get stuck on words, you’re constantly checking your dictionary while reading the newspaper, and worst of all, you can hear all the terrible, embarrassing mistakes you’re making as they come out of your mouth! Fluency is far, far away, and you know it. But you didn’t used to know that. When you started, there were things you knew that you didn’t know. The more you learned, however, the more you learned you needed to learn. There was so much out there that you didn’t even know you didn’t know! The rest of the iceberg, hidden beneath the waves, waiting to be discovered. How’s your experience been? Have you crested Mt. Fluency? Is the peak in sight? Are you still staring up at the mountain from base camp? well it’s been a bit of fun trying to learn everyday a languange in this case norwegian but it’s hard as well by that fun ! And yeah strongholds i’m steady before them ! Tearing’em down and so to go into another step that of course i know i will take ! Every stage where we want to be in and reach isn’t easy but with hard work we can reach all these ! I climbed beginners hill for Russian and couldn’t go ahead. For French conversation ridge is done but I know a lot of hard work to be done to reach on the top of mt fluency. Hope will reach there soon. @Deepak Thanks! You’ll get there. Or not, which is actually okay too. Conversation ridge is a fine place to hang out and have a chat. My English has climbed Mt. Fluency, but all my other languages (Spanish, German, French, Japanese, Bulgarian and Hebrew), are looking at Conversation Ridge from base camp in awe. So many languages to learn, so little time! I really love your comics! All those experiences in language learning that you draw, remind me a lot of my everyday struggle with it. Right now, I’m in Mt. Fluency of English, but my Italian and German are still trying to get out of the Conversation Ridge, and my French got stuck in beginners hill. Even so, I plan on learning many more! I strongly believe language learning is the key to travel and knowing our world and people. @Alejandra Agreed. Glad you like the comics! It depends so much on the purpose because of which you’re learning the language that I couldn’t give a specifit answer. I love learning languages and I would love also to travel to the places where those languages are spoken. But I can’t. I have almost never moved from Spain, although I speak English, French, Portuguese and Greek. I mean, in most cases people learn a language because they have to or want to travel to the place where it’s spoken, and so they will improve a lot their skills when they’re there, speaking with natives. That’s essential if you want to master a language, to climb that Mount Fluency. In my case, I try to overcome this situation by reading articles and tweets in those languages, listening to some music and watching videos or other programmes of the French or Greek TVs. Internet era is wonderful for us because of that. In any case, I’m on the Conversation Ridge of French, Greek and Portuguese, I guess. Also in English, because although I’ve studied it for so many years, I’ve never been to an English-speaking country, and I have difficulties understanding british English and ordinary language. Now I want to start with Chinese, and as long as I don’t have plans to travel to China, I think the most prudent position is to aim to climb the Conversation Ridge. @Nakascit I completely agree with that article, actually. 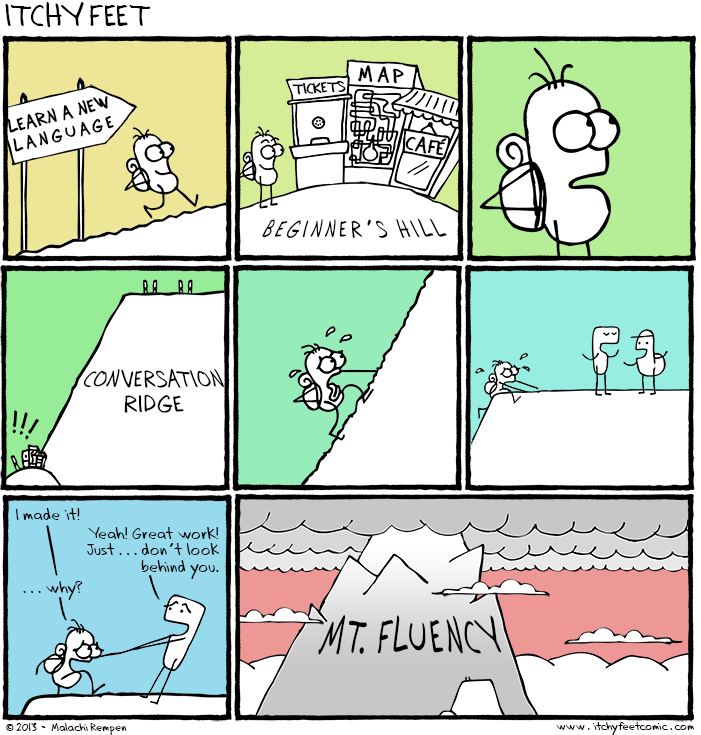 Fluency is a terrible goal – that’s why in the comic, the peak of Mt. Fluency is invisible, above the clouds. You need to set your own goals–realistic, achievable goals. For instance, my goal with Italian was to be able to speak with that sing-song rhythm, uninterrupted by pauses. That does not mean I’m fluent! Just that I can talk without stopping. Or for German, I want to be able to use all the various verb forms without translating them in my head first. That’s an achievable, realistic goal, and has nothing to do with fluency. I think I am somewhere in the middle of Mt. Fluency in French, English and German but I guess I’ll never reach the top of that mountain. It’s so difficult to master the foreign language at the native speaker level and especially if you are not living in the country where the language is officially spoken. That’s what I experience. My German improves greatly because I live & work in Germany but in the meantime my spoken French degrades drastically as I don’t have much opportunities to speak it. So you can climb the Mt. Fluency but if you don’t put effort to stay on the top, you slides down. @Katarzyna Definitely true. Although Mt. Fluency isn’t a goal in itself. You have to set your own goals, as another commenter on here mentioned somewhere.